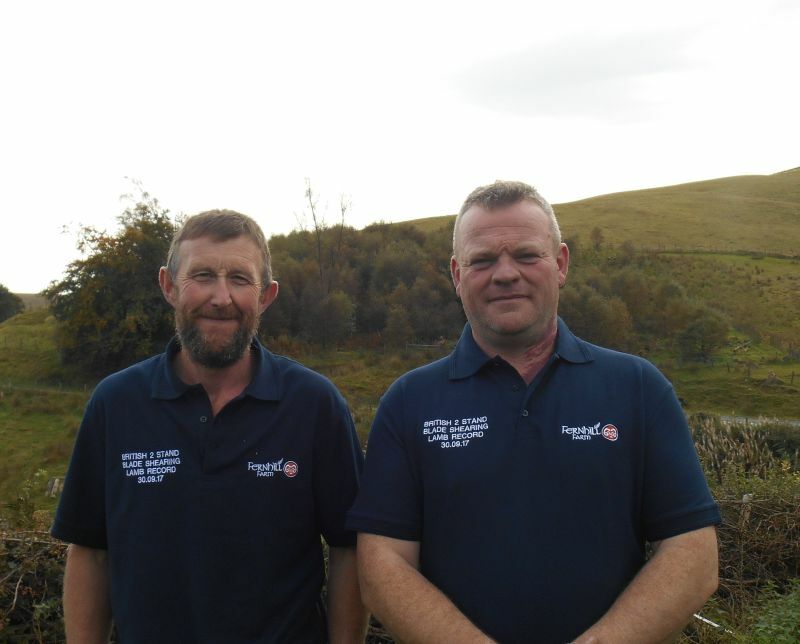 Two Welsh blade shearers have become UK champions for the ‘Nine Hour Two Stand Blade Shearing on Lambs’, setting a new record. Starting at 5.00am on Saturday (30 September), at Fernhill Farm, in Compton Martin, Somerset, the two men sheared a total of 397 sheep which was an average of 44 sheep per hour. As part of this attempt, Gareth also gained the solo blade title, shearing himself a total of 202 sheep. Using 7.25 inch blades they set these records in a gruelling 9 hour session, shearing Romney X Shetland lambs, courtesy of Andrew Wear. As there were no previous UK records, the two have established British firsts. Both men are Welsh wool producers and top UK blade shearers. Clive is also a British Isles Shearing Competitions Association (BISCA) judge. The competition was supported by British Wool, who run both blade and machine shearing courses as part of their annual training programme. Gareth, a sheep farmer in the Snowdonia National Park, farms over a 1,000 sheep at 2,600 feet in Gwynedd. He cut his teeth on blade shearing aged 15, and has competed for Wales and sheared around the world. He has just returned from New Zealand, where he competed against fierce competition in the World Championship Blade Shearing Finals. Clive Hamer farms at Hirnant, Elan Valley, near Rhayader and shears sheep commercially both in the UK and in New Zealand. He also regularly takes part in sheering competitions. In describing this record-making event, Clive says: “This was a big challenge and I am delighted to have sheared alongside Gareth to set the record. In recent years, British Wool have seen a revival in popularity of blade shearing, and they annually run numerous blade shearing courses. In addition to the young shearers wanting to learn this skill, many of those attending these courses are small holders who want to have the ability to shear their own flock as opposed to bringing in contract shearers. Shepherds also find a pair of shears useful when they come across a solitary sheep that has escaped the shearer at shearing time, as Gareth explains: “I do truly believe that this is an important skill which should be maintained, especially for upland farmers. The overall aim of this attempt was to set both a record, for double stand and solo, and to set a British sheep shearing standard. When asked why setting the benchmark was important Colin MacGregor, British Wool’s Head of Shearing, said: “Shearing is integral to the harvesting of wool and as such we must ensure that we maintain skills across a range of techniques. 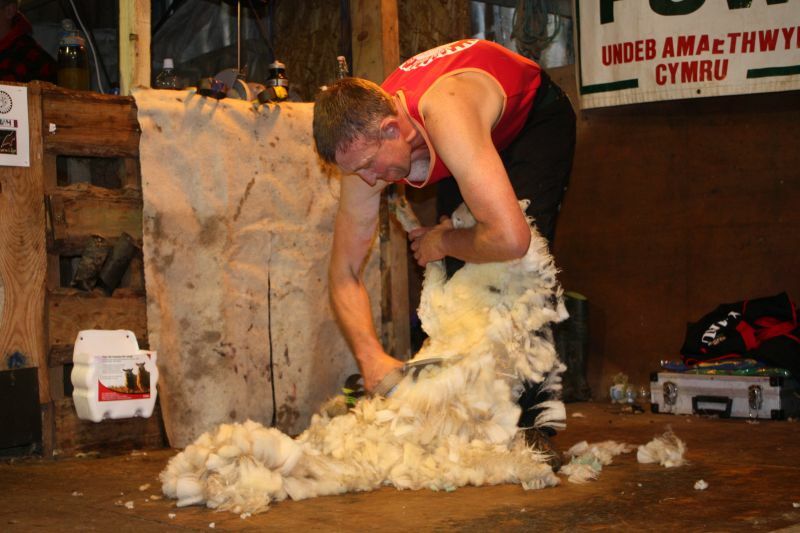 “In the last few years there has been a resurgence in both competitive shearing and record attempts, both which have helped to raise the profile of sheep shearing. “As a result we now have a very healthy group of young people across the UK who want to develop their all-round shearing skills and this includes blade shearing.